ACWW'S early days Rick Shiomi, Robert Kikuchi, Sammi Yakima to, David Henry Hwang, Jim WongChu #1980 #pioneers. Born in Hong Kong in 1949, and raised in Canada as a paper son, Jim Wong-Chu is known as a pioneer of the Asian Canadian literary movement. A poet, editor and historian Jim Wong-Chu is among the writers of Asian descent to question the Canadian literary establishment at the time that was devoid of diversity. Without role models or any blueprint, Jim and fellow like-minded activists such as Sean Gunn, Sharon Lee and Paul Yee began to experiment with different forms of fiction and decided to not only get published but also form informal writing networks to encourage other Asian Canadians to hone their craft. An idea for an Asian Canadian literary anthology thus germinated in the 1970s, when Jim Wong-Chu and a group of young Asian Canadians began to explore their identities. That exploration took them back to their roots and ignited a desire to express who they were as Canadians of Asian descent. At a time when Canada Council began to open up new funding to independent publishers, it was timely for these new Asian Canadian activists to step into the realm of creative writing. It was timely. Lacking voice from the Asian Canadian communities, an anthology was published, called Inalienable Rice: A Chinese and Japanese Anthology (1979,) is groundbreaking as it was the first anthology entirely comprised of Canadian writers of Asian descent. Fresh from his UBC Creative Writing courses, Jim Wong-Chu was discovered by a publisher, who encouraged him to publish his UBC compilation of poems into Chinatown Ghosts (Arsenal Pulp Press, 1986) and is the first poetry book by an Asian Canadian writer. It was a coming of age or sorts for Asian Canadian writing, as fellow writers Paul Yee, Sky Lee, Wayson Choy and Denise Chong also began their writing careers and quickly established themselves as acclaimed authors. Before Asian Canadian writing was considered a genre unto itself, one of Wong-Chu’s most critical projects took place in the library stacks of the University of British Columbia, where he went over the entire inventory of books with a fine-tooth comb, looking up any literary magazines within the past thirty years. His mission in 1989 was to map all of the Asian Canadian writers and their material to compile them into an anthology of Asian Canadian literature. In selecting the best twenty best pieces, Wong-Chu and co-editor Bennett Lee co-edited an anthology called Many Mouthed Birds (1991). The publishing of this anthology set the way for the emergence of an Asian Canadian genre that continues to take shape today. One of the short stories included a piece by Wayson Choy, and was subsequently expanded into the Vancouver Book award-winning Jade Peony. In addition to co-editing Many Mouthed Birds, Wong-Chu also co-edited with Andy Quan Swallowing Clouds, published by Arsenal Pulp Press in 1999. In 1996, Jim Wong-Chu became one of the founders of the Asian Canadian Writers’ Workshop (ACWW) and moved from the basements to a formal registered not-for-profit society. 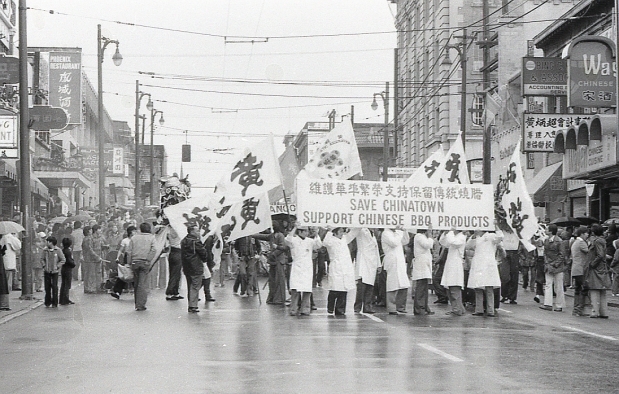 Until the early 1990's, there was not much of a critical mass of Asian Canadian writers. It wasn't until closer to the end of the 90's that university English departments were producing a lot of young people who wanted to write, and within a couple of years, a handful people in the Asian Canadian Writers’ Workshop suddenly grew to more 70 members. Wong-Chu started off simply, by offering workshops and then later turning to manuscript preparation by helping young writers to find a publisher. The Asian Canadian Writers’ Workshop became both an editor and agent for young emerging writers. In 1995, ACWW created an internal newsletter called RicePaper which later became a Canada Council-funded literary arts magazine. Wong-Chu was interested in creating a body of literature to legitimately establish an Asian Canadian genre that could be put into a library and used in educational institutions. In 2015, Wong-Chu co-edited his final anthology, the best of Ricepaper, called AlliterAsian (Arsenal Pulp Press). Ricepaper continued strong in its twenty years as a quarterly print publication featuring new and existing Asian Canadian writers, and evolved to become a digital webzine. Jim Wong-Chu's most recent project was the establishment of a literary festival celebrating Pacific Rim Asian Canadian writing, hosted by the Asian Canadian Writer’s Workshop Society. For the past five years, the festival organized workshops and panels led by critically acclaimed authors such as Paul Yee, SKY Lee, Joy Kogawa. As Jim Wong-Chu had once said, "Knowledge sets you free." Thank you for all that you've done for the community.